In the United Kingdom, our Corporate Citizenship programmes focus on environmental and social sustainability to bring positive change to the communities where we live and work. Through our Corporate Citizenship programmes, we bring a powerful combination of financial assistance, volunteering, fundraising and pro bono contributions of time to help young people across the UK gain employability and entrepreneurial skills. We strive to enhance economic inclusion and resilience at both individual and community levels. Globally we want to provide 3 million people, by 2020, with the right skills to help them into employment. In the UK, since 2010, our local programmes have provided training and assistance to thousands of young people to gain skills that will help them find work and stay in work. Our Skills to Succeed efforts focus on addressing youth unemployment by providing young people, aged 16-24, who aren't in education, employment or training, with support to build skills and obtain work. None of the work we do would be possible without the support of our charity partners. We work with multiple organisations to deliver the Skills to Succeed programme. The Movement to Work programme was created to further social mobility. It is a voluntary collaboration of UK employers committed to supporting 100,000 unemployed young people, giving them the training, work experience and confidence to find a job. To find out more about Movement to Work download the credential and watch the videos to hear directly from those the programme has helped. “In an increasingly digital world, demand for a digitally skilled workforce continues to grow in the UK. To meet this need, Accenture started a Digital Social Innovation (DSI) project called the Digital Skills Programme. This online social learning programme comprises of a suite of digital skills training tools which aims to address the nation's digital skills shortage. It is primarily aimed at young job seekers and entrepreneurs to open up their possibilities to a range of interests and professions and help drive positive outcomes. 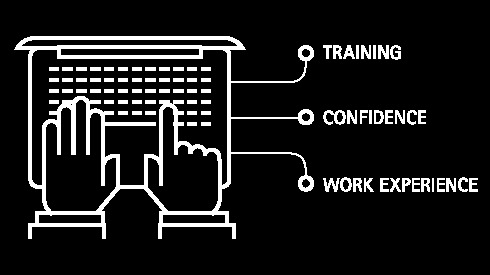 Accenture’s Skills to Succeed Academy is a free, highly interactive, online training programme which helps disadvantaged people build skills and confidence to make career choices and develop the key employability skills they need to find and sustain employment. Jobseekers are invited to access the Skills to Succeed Academy through employment support programmes run by Accenture’s national delivery partners. Our partners, which include The Department for Work and Pensions, National Careers Service, Careers Wales, Skills Development Scotland, East London Business Alliance (ELBA), Careers and Enterprise Company and CIPD, support the hardest to reach in accessing and realising the full benefits of the training. Since its launch, the Academy has helped 60,000 people to build critical employability skills. Find out more about the Skills to Succeed Academy. The Skilling for Change project in Rwanda supported over 16,000 women by providing them with the skills, knowledge and tools to turn their micro enterprises into profitable and sustainable businesses. The Cherie Blair Foundation for Women partnered with Accenture and CARE International to promote the mong-term financial independence of Rwandan women as well as create new jobs, by providing a combination of e-mentoring, online and face to face training and improved access to financial services. Accenture is working with Tottenham Hotspur Foundation to develop a new programme designed to support local 25-50 year olds who are returning to work after an extended career break or looking to re-skill. The Foundation will also roll out Accenture’s Skills to Succeed Academy, a free online employability training tool and Accenture Digital Skills, a series of free online courses that teach the digital skills required to thrive in the digital economy. ELBA has been one of Accenture's key delivery partners for Skills to Succeed for many years, currently focussing on our Future Fit pilot which supports workers who are facing automation to build new skills. ELBA also provides volunteer brokerage services for Accenture employees. Accenture supports OnSide to run its "Get a Job" course at seven Youth Zones in the North West of England, helping young people to get a first step on the job ladder. Accenture supports the Prince's Trust's personal development and employability programmes across the UK, and also helps build partnerships in key sectors with skill gaps, assisting young people on their journey to live, learn and earn. Accenture co-founded Movement to Work in 2013 with the aim of providing training and high quality work placements to young people that are NEET. We are committed to delivering placements equivalent to at least 1% of our UK permanent workforce every year, and our placements consist of multi-week programmes that include vocational training, employability skills and meaningful work experience. We have joined forces with Bethnal Green Ventures and the Resolution Trust on the WorkerTech partnership to fund and support ambitious ideas for using technology which helps workers to thrive in the digital age and prepare for the future of work. In Accenture, 89 percent of people say that job satisfaction was enhanced as a result of helping others. Volunteering is a core part of Accenture’s Corporate Citizenship offering, which enables all United Kingdom employees to play a role in improving the way the world works and lives by offering everyone three days paid leave to volunteer. We provide our employees with lots of opportunities from volunteering and doing charity work to taking part in pro bono activities. As part of delivering our 2020 strategy to skill three million people across the world, involving our people to be a part of the vision, is more important than ever before. By 2020, we anticipate seeing an evolution in the volunteering landscape across the United Kingdom. Employer-Supported Volunteering (ESV) is expected to undergo unprecedented growth and change, driven by a blend of economic, technological and government forces. The Organisations who embrace this change have a tremendous opportunity to make a greater social impact, whilst also benefiting their businesses. Accenture's report—A 2020 vision for Employer-Supported Volunteering highlights the five key trends that are emerging in the space and offers recommendations to help organisations position themselves to maximise social impact. Our people consider giving back to their communities a key part of what makes Accenture a great place to work. What do our people have to say about corporate citizenship and what it means to them? Watch this video to find out.